Cellinea is a safe, tested and effective remedy for cellulite that you can try from home. It is shipped directly to you in discreet packaging to ensure your privacy and it works for 97% of the women who tried it during double-blind clinical studies. Reducing the shearing activity between fat cells and connective tissue to allow your skin to look better, react in a more supple way when touched and feel smoother – Cellinea is an opportunity for you to start showing off your inner beauty more easily. Be confident, be proud of who you are and feel great when people ask to take you picture. For serious illnesses there is no substitute for the care of a trained physician. However, going to weekly doctor appointments for expensive and painful abrasion skin treatments will have you wishing you tried Cellinea instead. 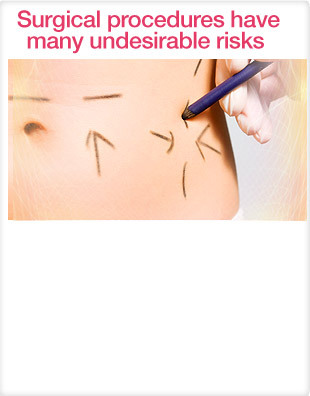 Liposuction and other related cosmetic surgery procedures have long lists of unwanted drawbacks. In many cases, even when they work, they aren’t worth the risk and the reward is minimal. Cellinea is the safe, effective and easy choice. Every woman cabinets full of cosmetic lotions, creams, muds and applicators. They’re messy, they take up a lot of space and when used on cellulite… they really don’t work. Unlike make-up, Cellinea treats your skin at the molecular level - where it matters most!